Independence Day has become rather important to me. All it took was watching the John Adams mini-series a few years ago (and a few times since). Watching those scenes where the details of the Declaration are hammered out. Oh my gosh, I loved how they played Thomas Jefferson. Seeing those actors embody the Founding Fathers. Well… the whole thing gives me goosebumps. 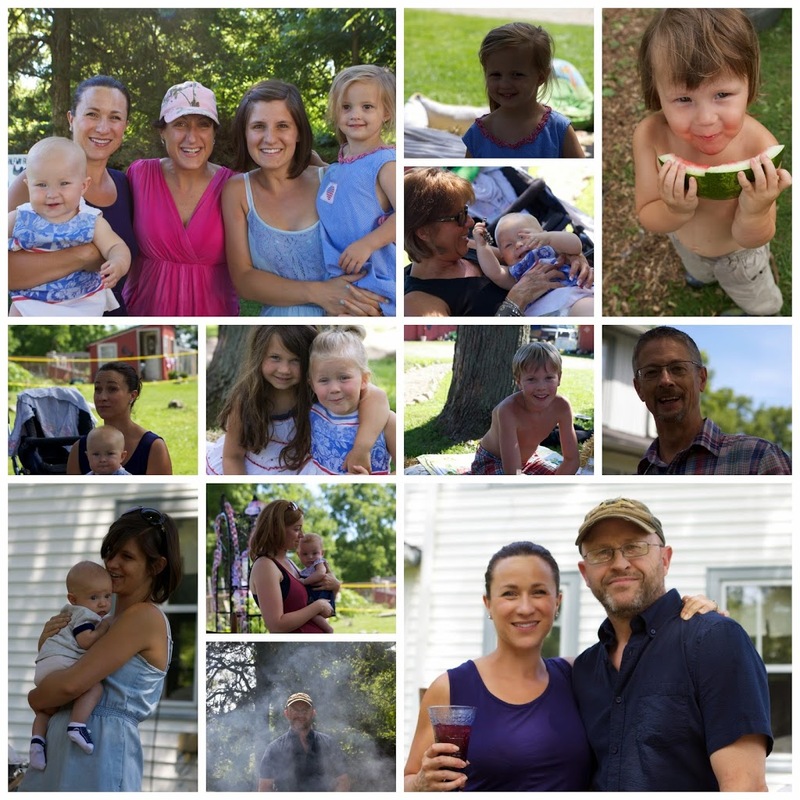 Last year we began a new tradition: A Fourth of July party. It’s a simple celebration. We provide meat and drink. 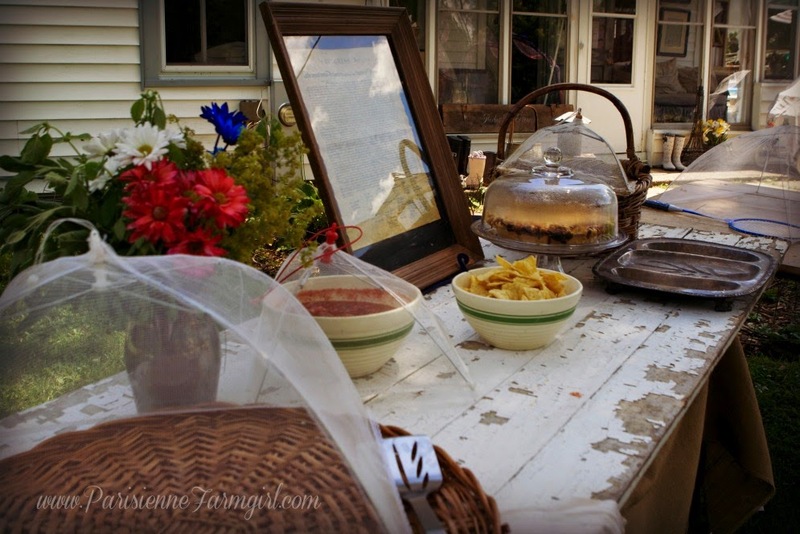 Guests, primarily family, bring a dish or two to pass. There are bags, badminton, tons of food, babies everywhere and my homemade sangria. This year we didn’t do the “Half-Way Farm” campgrounds but we hung out around the fire pit late into the night none-the-less. Did I mention lots of sangria? 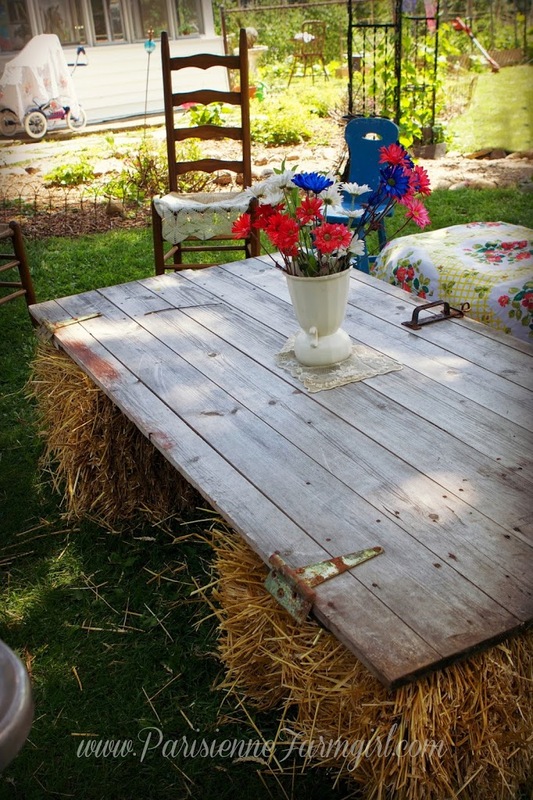 I was so excited this year as I had the brainstorm to use one of my old barn doors as a coffee table, hay bales as intimate seating, even an oil painting hung from the tree and a hooked rug for babies to crawl on. I loved the idea of everyone lingering around a low table, a place to put your glass, low enough for adults and their little ones. An outdoor living room. 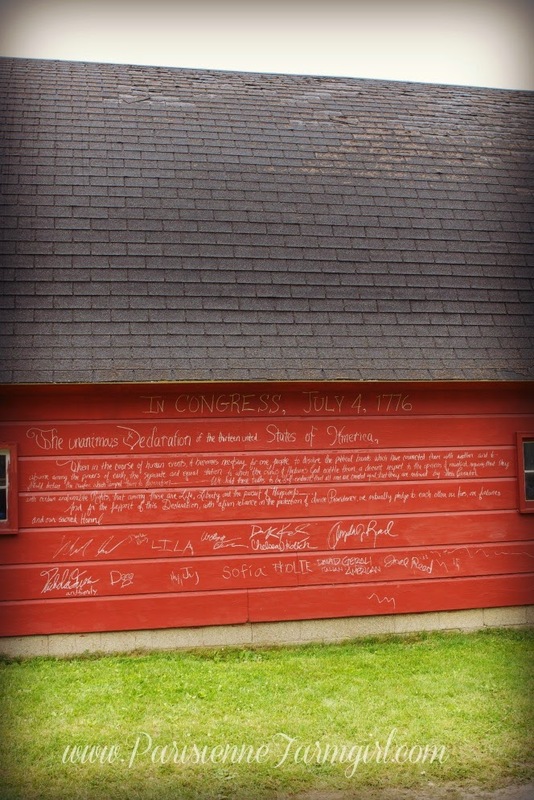 The piece de resistance was the most stirring lines from the Declaration written on the side of the barn. I love to recreate fonts so I had a little fun with some of the more noticeable letters. I then invited every guest to read it at their leisure, ponder the words and then sign their names. I loved that. It felt special. It felt patriotic. It felt founding. I hope to add guests every year. 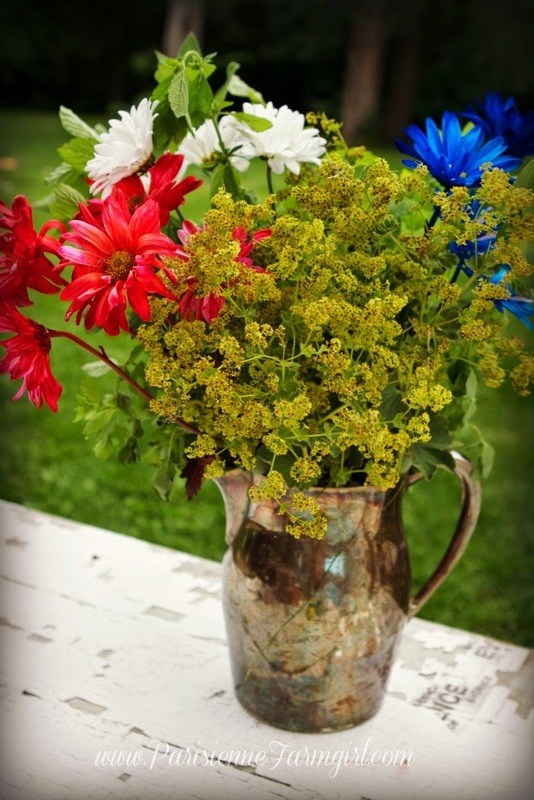 Sometimes I am cautious about inviting people to occasions that are on coveted weekends like the 4th. I never want anyone to feel obligated, you know? I will do the “Barn Declaration” every year from now on. I loved it that much. 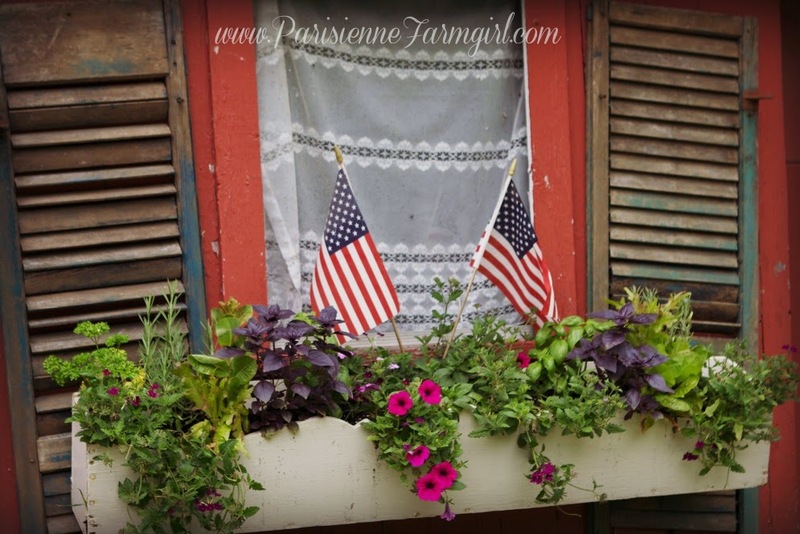 The bunting and flags will stay on as farm décor throughout the month of July. Did I mention I love bunting? If you find it at a garage sale, shag it and I’ll pay you back! 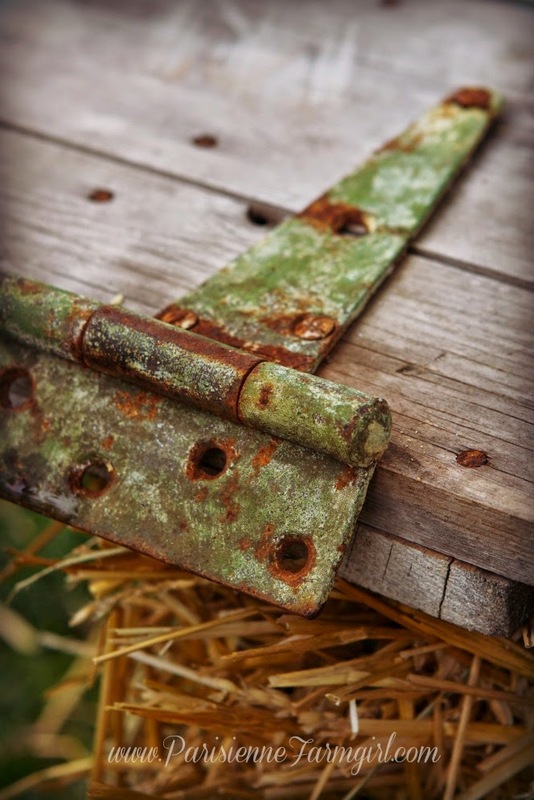 Here at Half-Way Farm, la ferme a mi-chemin, we are still waiting for a hot summer. The garden seems slow. So much rain and only a handful of days so far above 80 degrees. The days too cool for a dive in the pool. 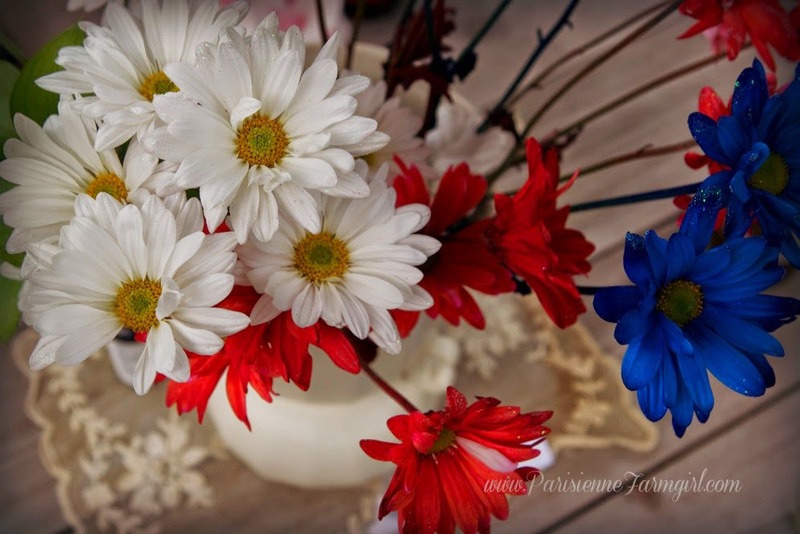 But our Fête Nationale was lovely. Merci to all who came. I love it. Now I am searching for that series (and might be hanging something framed from one of my trees tomorrow~very inspired! ). I love this. 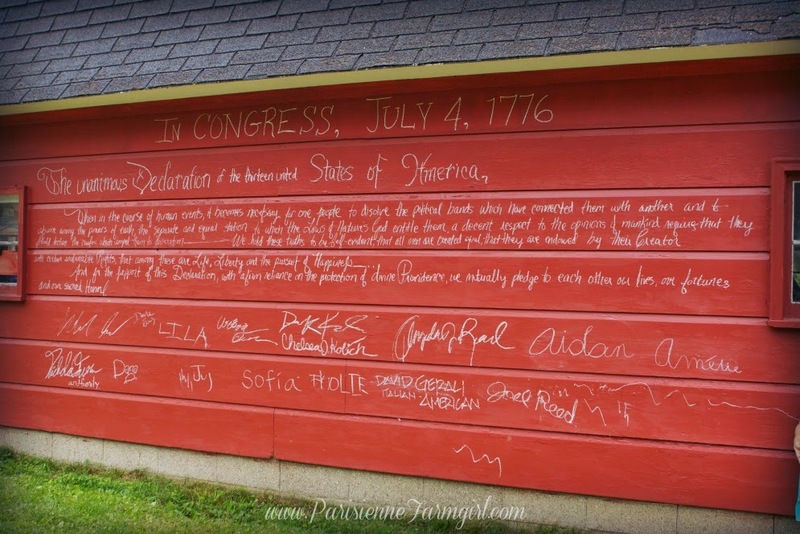 And, the barn Declaration is fantastic! Your party made me feel so patriotic!! 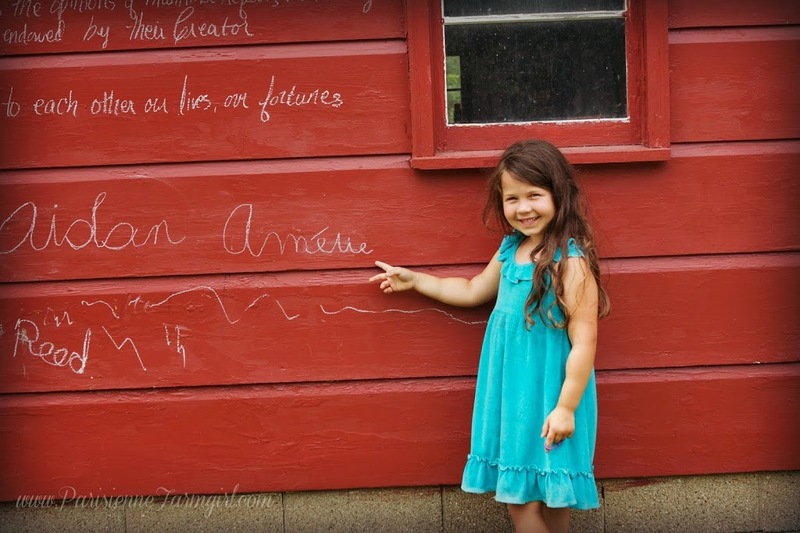 Writing on the barn was a grand idea, and so inspiring. I love to read about your moments in life. Thank you for sharing. 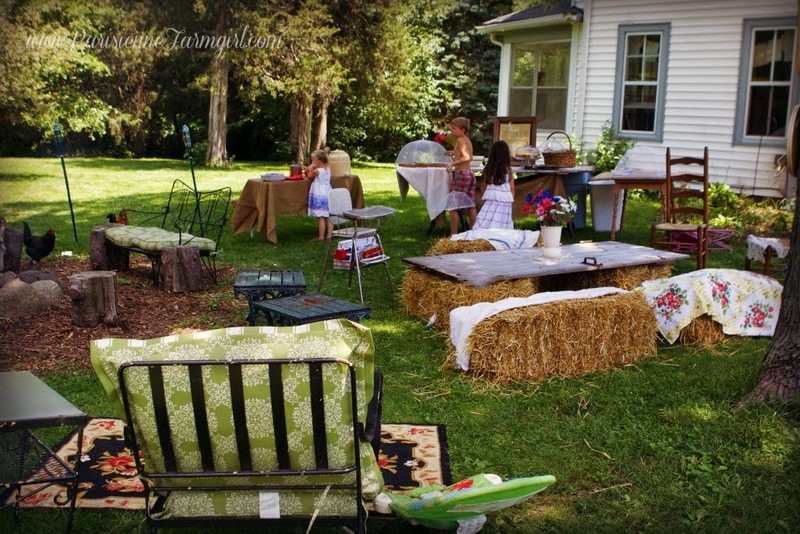 Love your outdoor room. 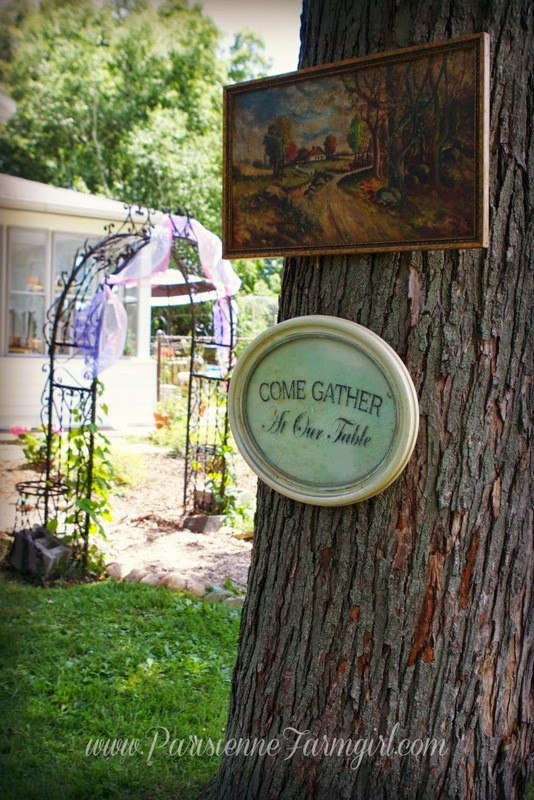 And that “Come Gather” sign is so wonderful. Love. Love. Love it. 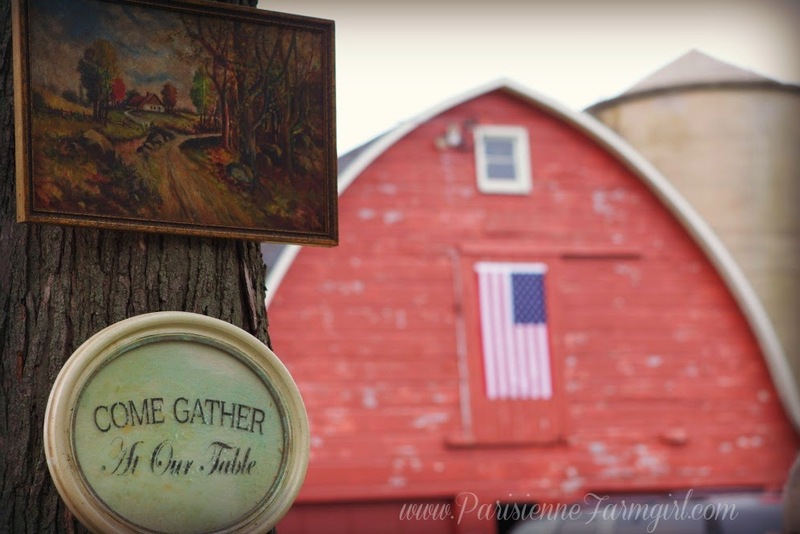 Love the “Come Gather at Our Table” sign. 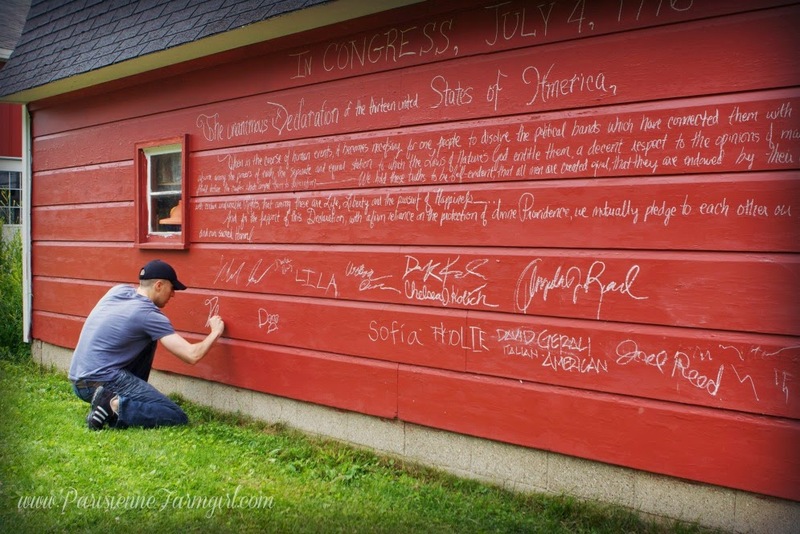 I will keep in mind the Declaration of Independence idea for next year!!! You are sooo creative!!! !